Mahfuza Akhter Kiron, who heads women’s football in her country, was refused bail after being arrested last week for telling a television talk show nothing more serious than that Sheikh Hasina, the longest serving prime minister in Bangladeshi history, was less interested in football than cricket. A local sports administrator, Abul Hasan Chowdhury, filed a formal complaint against Kiron and the courts then issued an arrest warrant against her. 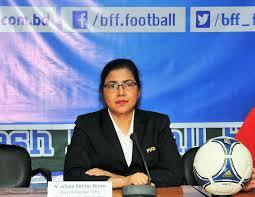 “Mahfuza told the TV show that [the] PM maintains double standard for football and cricket. She rewards cricket for personal gain but ignores football,” Chowdhury’’s lawyer was quoted as saying by the Associated Press. The defamation claim alleges that such comments embarrassed the entire nation. The government of Sheikh Hasina has been accused by human rights groups of using tough media laws to stifle dissent. So far FIFA has failed to respond to one of its inner circle being jailed. Kiron was elected to the FIFA Council in 2017 and served as a member of the organising committee for the 2015 Women’s World Cup and the last two U-20 Women’s World Cups in 2014 and 2016.